Publishers Site When I was a kid I loved rockets. The space race was drawing to a close but the Space Shuttle was coming into service and of course there were still re-runs of Thunderbirds to watch. I knew that if we wanted to have the space stations and moon bases we were promised then we would have to come up with better rockets. I didn't know much about chemistry but I knew that nitroglycerin was a powerfully explosive and unstable liquid. I reasoned that if only you could get a tank of the stuff to explode a little bit at a time, you would have an awesome but probably extremely dangerous rocket. Ridiculous right? It turns out I wasn't this only one was that idea. The proposals had been written, the grants had issued, the test beds built, and the broken glassware and twisted metal hauled away decades before I was born. It's been tried. Everything has been tried. Ignition! is an exhaustive and occasionally exhausting review of all the promising lines of investigation in the years immediately following WWII up until the early 70s. 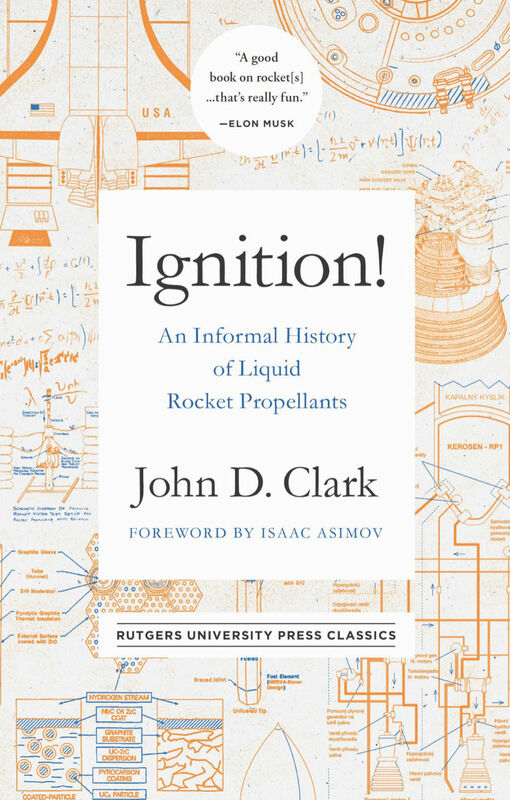 Clark was involved in many of these efforts and he is well placed to comment on the hot leads and blind alleys of the feverish efforts to lift ever-increasing payloads without exploding. The language can get quite technical - Clark is not afraid to throw in some chemical formulae and some physics calculations when he feels he must. But the bulk of the book is a breezy roundup of a career spent trying to blow things up juuuuust slowly enough. Clark is at his best when he lets his incredulity shine through when describing some of the more far-fetched ideas that actually got funded. I notice that Clark himself is careful to note that he was not involved in any of the more looney schemes and it is hard not to smile at the hint of smugness that rises from some of the pages as testbeds get destroyed and eyebrows singed. I love me some professional gossip. The kid in me was particularly thrilled by the tales of the fuel/metal slurries and the hair-raising attempts at using unbelievably toxic organic mercury compounds as propellents. Not even in my most crazy fever dreams had I ever thought of anything as mad as that. This edition has not been updated with anything more recent than 1972 but it does have a forward from Issac Asimov and a pull quote from Elon Musk. You can quibble about how worthless they both are/were as humans but they do know about rockets.